Ancient coins minted 2300 years ago were discovered in Kyzylkend village of Azerbaijan’s Imishli region. Villager Etiram Rzayev discovered nine coins with an image of Alexander the Great, ruler of the ancient Greek kingdom of Macedonia. 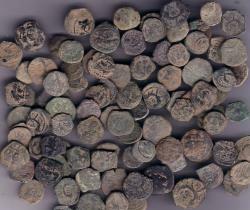 A group of specialists of Azerbaijan's National Academy have already visited the village and explored the found coins. According to the preliminary version, these are silver drachmas, issued during the reign of Alexander the Great (336-323 BC). Alexander the Great led a military campaign throughout the Middle East and parts of Asia. He is credited with founding some 20 cities that bore his name, including Alexandria in ancient Egypt, and spread Greece's culture east. He died in Babylon, the present day Iraq, in 323 B.C. The specialists also observed the territory where the treasure was discovered, and revealed here an ancient habitat and necropolis. In the near future, archaeological excavations will be carried out at the site. The ancient trade and caravan routes run through the territory of Imishli region, located in the Kura-Aras Lowland. Earlier, ancient coins have been discovered in Shamakhi (1958), Gabala (1966) and Agsu (1972) regions. Azerbaijan was on the path of the Great Silk Road bringing together two different worlds – the East and the West. The Silk Road in Azerbaijan passes several cities and settlements in the north-western direction, including, Baku, Shamakhi, Basgal, Lagich, Gabala, Sheki and others. Bilateral land and sea routes linked Azerbaijan with China, Syria, India, Asia Minor, Iran, Egypt, Russia, the Arabian Peninsula, North Africa and Europe. The British used to lay their routes to India via Azerbaijan, Indian merchants traded in spices and cashmere fabrics with Baku and Shamakhi.